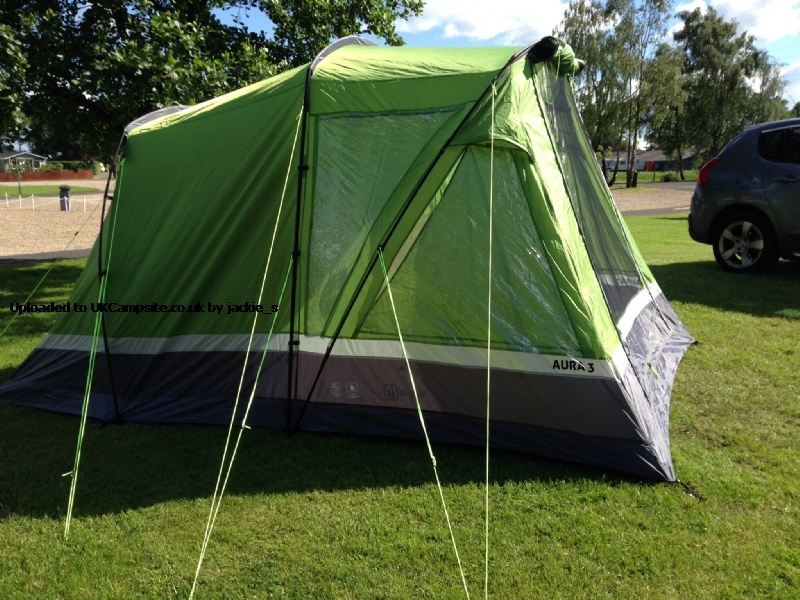 All in a great tent for the money (Aura Elite 3 - blue updated version). Bought as a quick erect tent for weekend camping. Although it does not have the finishing touches and quality of our older and bigger Outwell tent, it kept the two of us warm and dry. We are particularly glad that we bought the add on canopy as this makes such a difference when it rains. Only a few small complaints: although you can zip the door off the canopy, it only zips one way and you cannot roll it up as there are no ties. We made do with clothes pegs however, which worked fine. Also, there is no hanging loop in the ceiling for a lantern which our Outwell canopy does have and is very useful. Finally, why oh why do the canopy curtains roll down and not up and so collect condensation? I wanted a tent for longer stays for me and the dog. It needed to be tall enough so that I could stand up in and have enough space for sleeping and living in should the weather not be suitable for being outside. It also had to be pitchable by one person. 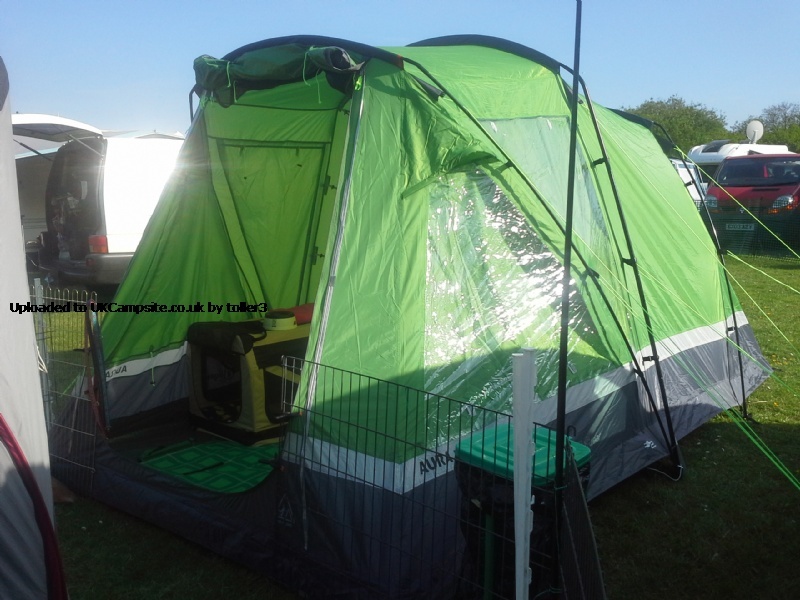 After spending a long time at the local tent retailers standing/sitting/lying down in various tents I had narrowed it down to three or four, I had a chat to one of the assistants and with his knowledge we eliminated all but the Aura-3. The first time I pitched it it took about 40 minutes, now I know what I am doing I can get it up or down in under 20. Colour coded poles and sleeves make it very easy and efficient. For some reasons on some occasions the poles can be hard to hook on to the pins on one side, if you do find this simply unhook the side that is already in, hook up the side that was giving you problems and then re-hook up the side you have just released. Sounds odd and common sense says it shouldn't make any difference but it does work. Plenty of space to stand up in both the living and the sleeping areas and enough space for me and the dog to not be tripping over each other all the time. I suspect it would be a little crowded with 3 adults in there. In addition to the pegs that come with the tent I have bought some heavy duty pegs as we tend to go camping in some fairly exposed campsites. The tent does creak and the outer door flap when the wind picks up but other than that this tent, when well pegged down, appears to be able to withstand more than most. I have used it on the top of the cliffs high above Whitby and also on the coast on the Inner-Hebrides and the worst that happened was one of the guy lines worked itself loose and came off it's peg. Curtains: the triangular windows are OK and two of the curtains fit just fine. However the curtains that are fixed at the bottom of the window and roll up could really do with an extra bit of velcro on the side to stop them gaping. Outer Door: The door doesn't zip all the way round. This is both an advantage (extra ventilation) and a disadvantage (flaps in the wind). Flapping can be minimised by remembering to reach out and fasten the velcro on the corners when you zip the door closed. 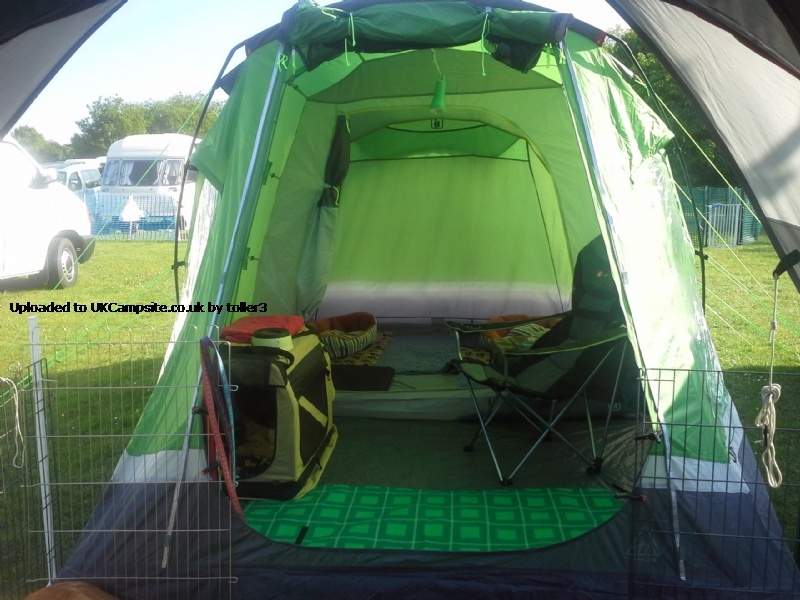 Zips: the quality of the zips on my tent seems to be OK, the biggest problem I have is that if I leave the zips at the bottom of the door (sleeping or inner door) then the dog can get her nose between them and let herself out. To get round this I leave them together higher up, the downside to this is if the tent is moving in the wind then the zip tags jingle together. All in all a robust tent that has and continues to meet all my long-stay camping needs. Update to first review. Used the tent over the last couple of days. Still pleased we bought it. As stated before not much room with one adult and two kids but it really was only used to sleep in and store clothes in. We had continuous heavy rain overnight and into the morning and there were no leaks or drips. A slight wind got up but nothing that you wouldn't expect even the cheapest of tents to stand strong in so can't comment on wind. The zip on the bedroom pod is very cheaply made (although I guess inline with the brand and price) so care needs to be taken with it. The curtains gaped a little as there was no Velcro to attach them too just toggles but it wasn't a huge issue but thought I'd mention it. I wouldn't pay full price for this tent unless it's exactly what you want but if you get it on offer like I did, I'd grab it. We were looking for a weekend tent. Easy to pitch instructions easy to follow. This is what we got from this tent. First pitch took 20 mins. Head room great. We had two adults and dog. Think space would be tight if three adults. We used in weather conditions of hard frost , heavy rain and sunshine. Tent performed well. Would have been nice to have extra poles to make front door a canopy. Value for money. Really easy and about 20 minutes to put up, living space is good for 2 adults only I would say. It is a little draughty in a stiff wind as there's no Velcro on the bottom of the outer front door. The best thing is the head height, I spent so many previous camping years with a bowed head, so this one is great. 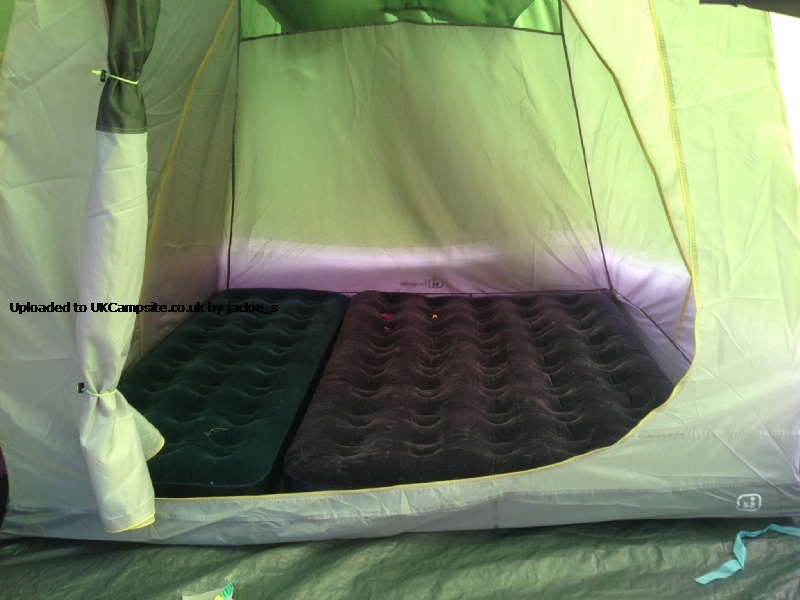 We were in a real rainstorm this weekend and not one drop of water inside as the sewn-in groundsheet is fantastic. Really recommended. 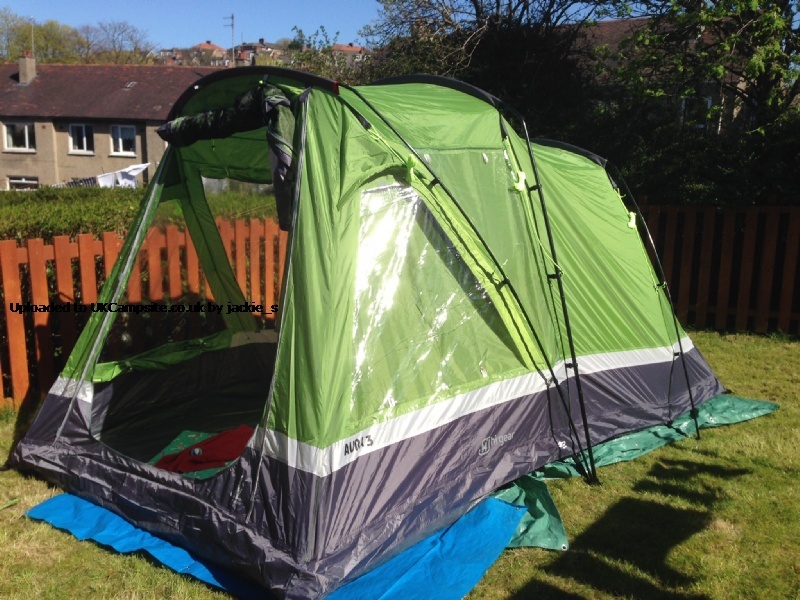 I bought this tent for my daughter and her 2 small children, ideally I'd have liked bigger and wished they had a 4 person one, however I bought it for �130. Fly screen on door, fully sewn in ground sheet. It took me and my daughter 20 minutes to get it up (minus the guy lines). Was reasonably simple. There are 3 colour coded fibreglass poles although the middle pole is only fibreglass on the roof section, the side poles are steel, I'm assuming this adds a little more stability but as this was a test pitch in the garden there were no adverse conditions to test this out. Pitches outer first or after initial use pitches all in one. The green colour is brighter than I remember from the shop but I don't chose my tent based on colour so I'm fine with it. The bedroom fits one double and one single average sized air bed but there is no space left for storing anything although there are storage pockets. The living area is small (around the size of the bedroom), but acceptable for 2-3 people. There are 4 windows in the living area 2 that you roll the 'curtain' down and two which roll up. Packing up was simple, and we even fitted the tent AND the poles back in the back. The pole bag is more substantial than I've had with similar price range tents with the top and bottom of the bag being lined with some filling to stop the poles pushing through the usually thin material bag. There are patches of the different coloured tent materials for repairs supplied in an attached pocket in the bedroom. Add your review of the Aura 3! 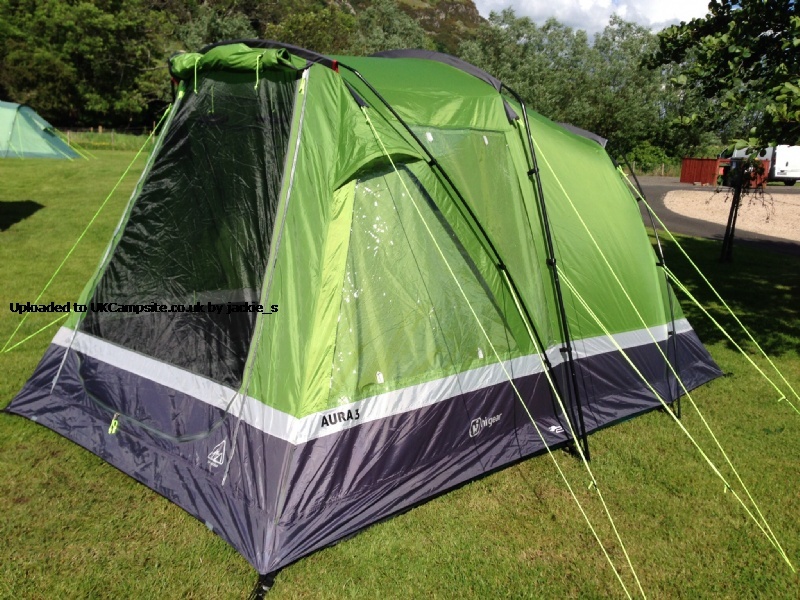 Hi Gear's Aura 3 is a sturdy, fully waterproof tent with a roomy living area that boasts large panoramic windows, letting plenty of light in and making it a great place to relax. 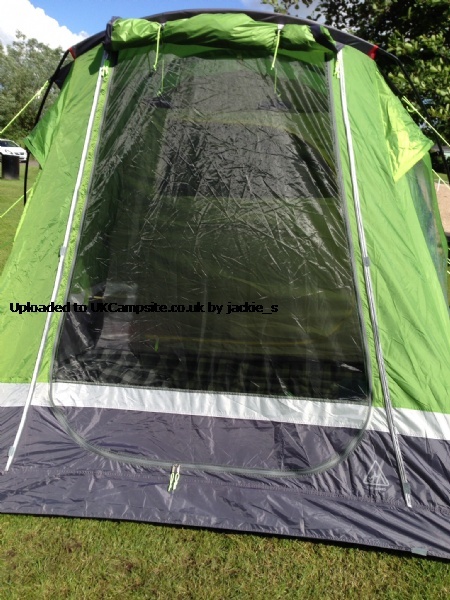 It's tall enough to stand up inside comfortably, and has a fully sewn-in groundsheet so you're totally protected from leaks, draughts and bugs. The inner bedroom is made from breathable polyester, with mesh vents for good airflow throughout. Easy to pitch, it uses strong fibreglass poles in reduced sleeves (less threading through, less stress!) so it will flex but remain stable in windy weather. The abundant guylines are brightly coloured, so it's easy to see on a dark campsite. And there are extras available to make your camp even more homely and comfortable: the Aura 3 Carpet adds warmth and softness under your feet, the Aura 3 Footprint protects and insulates the groundsheet (and makes pitching even easier), and the Aura 3 Porch extends your sheltered space, giving you a large area for storage, dining or play.